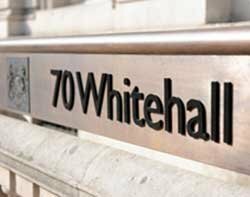 Whitehall has set up a new organisation to oversee moves to improve the digital delivery of public services. The Government Digital Service (GDS) has been created through a merger of the Cabinet Office Digital Delivery and Digital Engagement teams with Directgov, the "one-stop shop" for online government. The new unit will be "the centre for digital government in the UK", according to a Cabinet Office blog post on its remit. The aim of the service is "building and championing a 'digital culture' that puts the user first and delivers the best, low-cost public services possible," said the blog. The GDS will be headed by former G-Cloud programme director Chris Chant, and will implement the recommendations of Martha Lane Fox's review of the Directgov service. Lane Fox called for an overhaul of 750 separate government websites, to be replaced by a single internet "front-door" to public services on the web through Directgov, and the formation of a central team to be responsible for all government sites - which led to the creation of GDS.